Now, here's a curiosity. 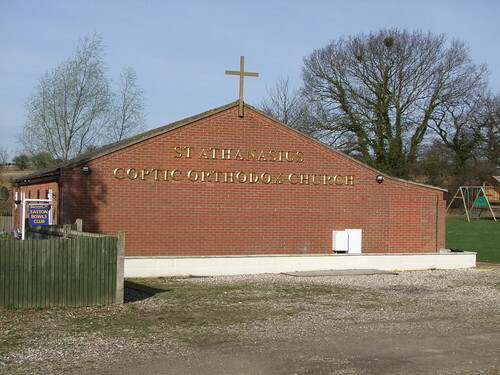 On the outskirts of Marlingford, but within Easton parish, is the only Coptic Orthodox church in East Anglia. Its buiding is the former pavilion of Easton Bowls Club, and its presence is explained by the fact that we are near to the campus of the University of East Anglia, which has many students from Egypt and the Middle East. South Norfolk Distric Council planning regulations have restricted its signage to gold lettering and a cross, so there are no illuminated domes or the like. Even so, its presence in a quiet, winding Norfolk lane is something of a surprise.